The daughter of Holocaust survivors, Rachel Fromer Shankman was born in a displaced persons camp in Munich, Germany, in 1946. The family came to the United States and settled in Nashville, where Rachel was raised. Like many Holocaust survivors, her parents didn’t talk much about their experience. But in 1960, they were interviewed by a Nashville reporter, and Rachel began asking questions. She was told stories of beatings, hunger, deprivation and death. She was told stories of small acts of courage and love that helped people in an untenable situation survive one more day. Afterward, she no longer took life for granted. 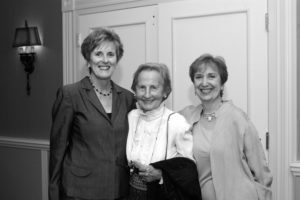 In the late 1980s, she and her husband saw a short documentary about a Canadian high school teacher who had been challenging the reality of the Holocaust in his classroom. Rachel was incredulous and outraged. Knowing that survivors and witnesses will not always be alive to tell their stories and aware that young people might have to choose between conflicting versions of history, Rachel started to look for solutions. In 1976, former Memphian Margo Stern Strom cofounded Facing History and Ourselves. The program was designed to teach students critical thinking skills. Using the Holocaust and the events of the ’20s, ’30s and ’40s as a case study, students learned that history is a result of a series of small decisions, many of them made by individuals. In 1987, Facing History and Ourselves began a pilot program in six Memphis City Schools and Rachel volunteered. Rachel had previously served as the regional director for B’nai B’rith Youth Organization and director of Memphis State University’s Jewish Student Union. When Facing History and Ourselves opened a Memphis office in 1992, Rachel’s many years of experience in working with youth and her passion for the organization made her an obvious choice for executive director. Under Rachel’s leadership, Facing History and Ourselves has worked with more than 300 educators in the Memphis area. Teachers learn an interactive process that includes readings, videos, group discussions and exercises. They then return to their schools and use the program in the way that is most effective for their setting. As a result, more than 30,000 students have learned that history is about ordinary people leading ordinary lives. Under Rachel’s direction, Facing History and Ourselves has moved into the larger community. In 1996, the office initiated a coalition called Cultures United. The group developed Memphis Building Community, a guide for schools and area clergy to use to discuss the history of Memphis. This guide became a model for other cities, including Chicago and New York. Always interested in coalitions and alliances, Rachel’s most recent project involves training young attorneys to go into the classroom to discuss issues surrounding law, morality and hate crimes.